Calcium - can reduce the body's absorption of T3 thyroid hormone. This is one reason why hormone medication should not be taken with food. More information about calcium here. Should Goitrogen foods should be avoided? - they include raw cabbage, peanuts, pine nuts, millet, mustard, tempeh and tofu. Do they prevent your body from absorbing iodine? Iron is important for the thyroid gland to produce normal amounts of thyroid hormones. Iron deficiency can also affect the immune system. Lack of iron causes T4 to not convert normally to T3 as much as it should be. More information about Iron here. Soy products - if you have thyroid disease and eat a lot of soy, your thyroid needs to be monitored more carefully because the phytoestrogens in soy can affect production of T3 thyroid hormone. Iodine - Adequate amounts of iodine are essential for normal thyroid function. Iodine rich food sources include iodized salt, grain, dairy and seafood. If you do not receive enough iodine from food sources, you may need to take an iodine supplement to support your thyroid function. More information on Iodine here. Selenium is as crucial as iodine for the thyroid gland to function properly and to remain healthy. Selenium is also vital for the conversion of T4 to T3, the active form of thyroid hormone. More information on Selenium here. Vitamin A deficiency affects thyroid function in regulating thyroid gland metabolism and TSH production by the pituitary. Thyroid damaging foods, nutrient deficiencies, toxic food ingredients, environmental chemicals and stress are a recipe for thyroid disaster. But figuring out how to recover thyroid health is not only difficult but next to impossible without expert help. Louise O'Connor, Naturopath & Wellness Coach can show you how. Click Here! Seaweeds - high in minerals, especially iodine, which nourish an underactive thyroid. How much should you eat and how do you eat it? Supplements and herbs, should be prescribed by a qualified practitioner. Zinc is crucial not only for having normal thyroid hormone production by the thyroid gland but also makes thyroid hormone work efficiently in cells. How much zinc should you take? More information on Zinc here. The Thyroid Diet and Lifestyle Program is intended for people who have unexplained symptoms or have been diagnosed with thyroid problems and are still feeling bad. The Thyroid Wellness Diet and Lifestyle Program is not a regular diet eBook or basic nutrition guide. It’s a complete program designed specifically for optimal thyroid health. 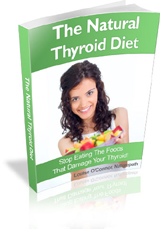 The Natural Thyroid Diet is a must read for anyone struggling with a sluggish thyroid. Dr. Friedman’s 3V3NSSF Diet (3 vegetables three times a day plus no starch, sugar or fried food diet) Dr. Friedman has been running the Obesity Clinic at MLK Ambulatory Care Clinic in Los Angeles and has come up with a simplified strategy for weight loss for everyone who is serious about losing weight. The Paleo Diet - low carb diet with lots of healthy vegetables and fruit. Thyroid Diet and Weight Loss Information Center - Resources to help thyroid patients lose weight by Mary Shomon, About.com Guide. All medicines, including supplements and herbs, should be prescribed by a qualified practitioner.